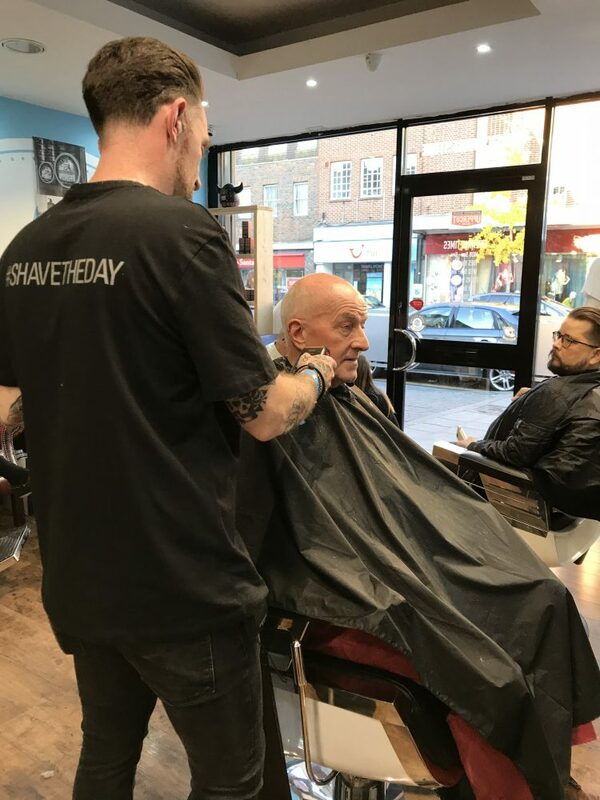 On Remembrance Sunday 12th November 2017, The Geezers were invited to the Shave The Day event for TABAC a German company who produce Male Shaving products. It was organised via Age UK and run on the day by 10 Yetis, a digital and online public relations agency. Seven Geezers agreed to go to the day: John McLaughlin, John Griffin, Ray Gipson, Tony Woodward, Don Tomlin, Barrie Stradling and Ricky Ayliffe. 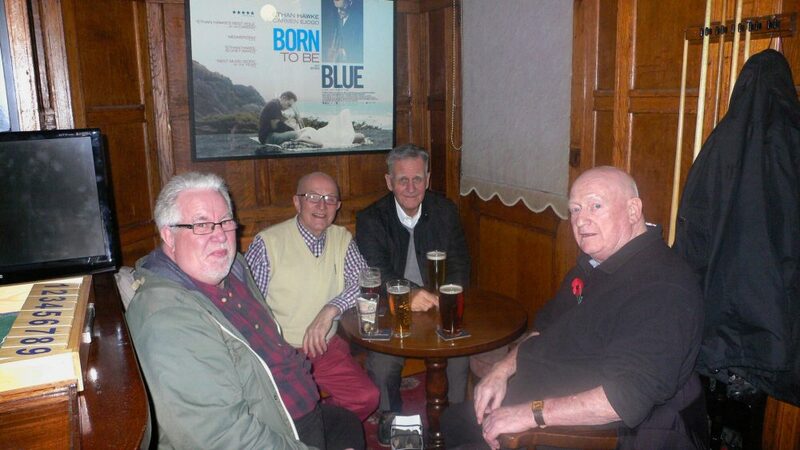 The purpose of Shave The Day was to find a way to alleviate elderly mens isolation by visits to their barbers. where they would meet people and interact socially with them. 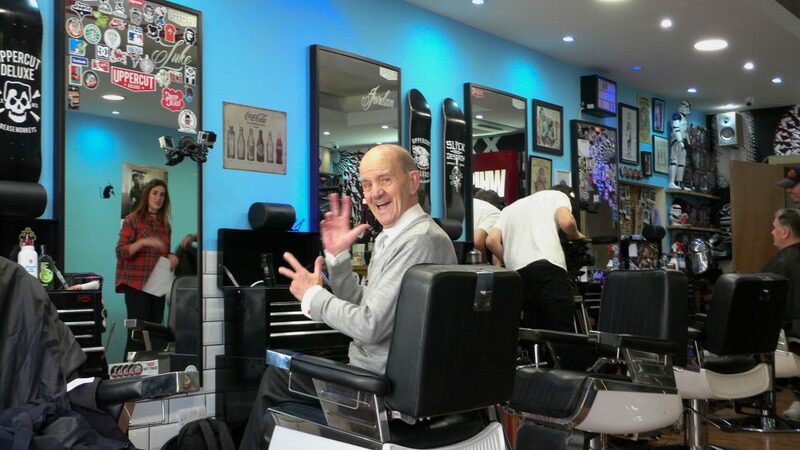 Fragrance brand, TABAC, filmed the Bow Geezers at Luke Dolan’s Barbershop for the campaign video. 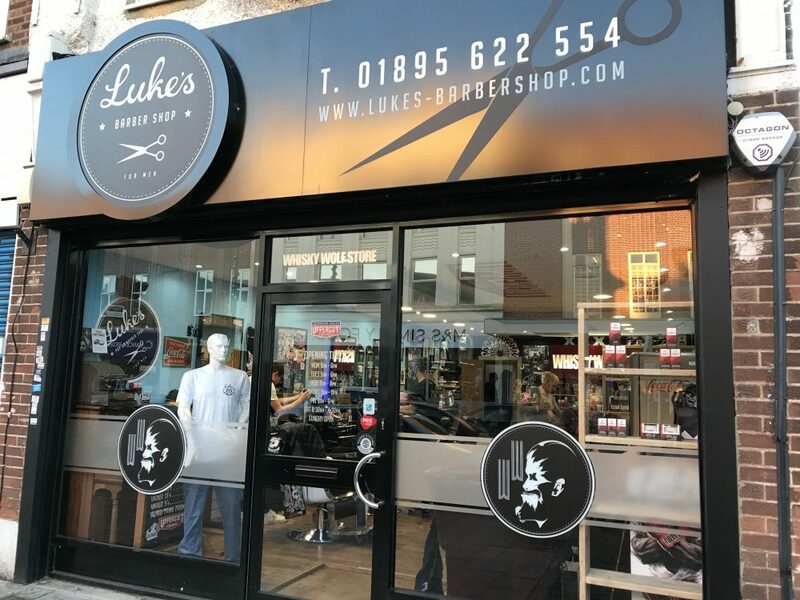 The Geezers were picked up by a minibus at Vic Johnson House, their headquarters in Bow, at 10.30am and driven to Lukes Barber Shop in Ruislip to start the fun at noon. Emma Debuse from FDD and Kalli Soteriou from 10 Yetis Digital, the social media agency, kept the Geezers supplied with food and drink. Once it was set up to film the Geezers sitting in the barbers chairs, two Geezers at a time took their places and had a haircut and shave. The barbers chatted with them about shaving and their lives whilst being filmed by 10Yetis. Once the makeover and pampering was completed the Geezers were filmed as a group, and interviewed individually. They were questioned about why a barber shop visit was an important event in older mens lives, and also asked about why they joined The Geezers and how beneficial such a club was in reducing isolation. Do watch the 5 min video below of the Geezers. Once this second batch of interviews were completed, the Geezers were all given numerous TABAC shaving Items including a shaving bag. “Age and growing old is a subject that the youth hide away from and one that older generations are confronted with daily. Age is inevitable and we may as well start to talk about it. “As our communities change around us, like pubs closing, community centres shutting and halls closing their doors, our habitat is changing and our elderly suffer because of it. Barbershops are opening up at an amazing rate and they have community spirit at their very heart and that’s why I wanted to play my little part in bringing back some of these community values and get people talking to each other, young or old. 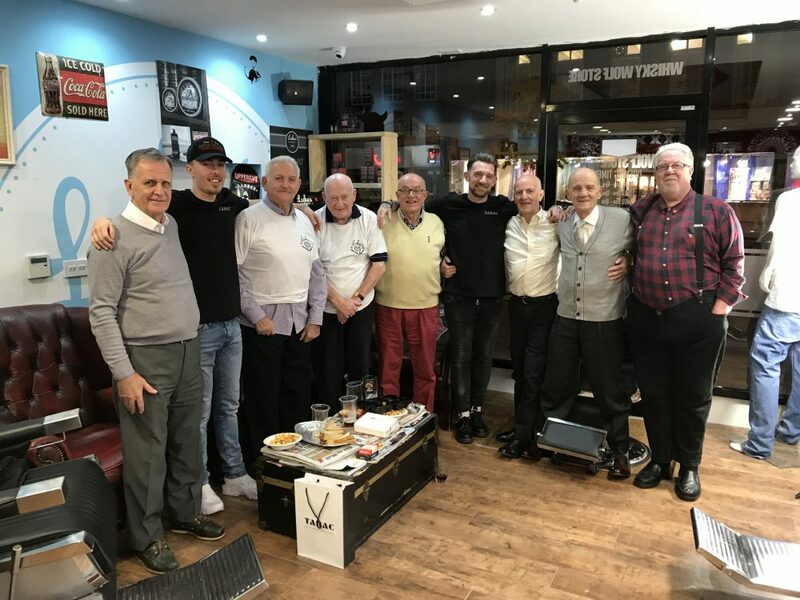 “The Geezers Club from East London were invited to be involved in Shave The Day at Luke’s Barbershop in Ruislip on Sunday 12th November 2017, our club is for Men over 50 in East London. The experience of going for a haircut and shave plus a talk with the barbers was an experience that older people welcome as it is interaction with people thereby eliminating loneliness. At 5pm the minibus brought the Geezers back to Bow after a very enjoyable and worthwhile day. 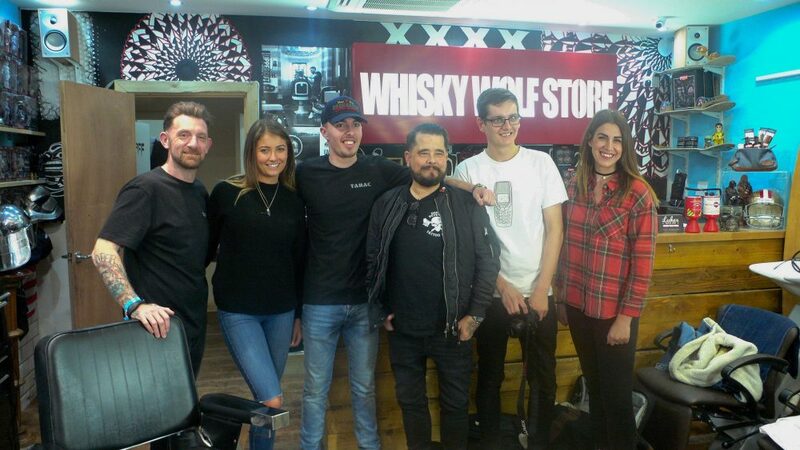 On 7th December John McLaughlin, Ricky Ayliffe and Ray Gipson went back for another shave and to be interviewed by Nita Rajan from Huffington Post & Sharron Peerless, Head of PR at 10 Yetis Digital. You can see the article and video here.